Limbert claims you don’t need a whistle if you speak from the heart. He separates Dad’s Playbook into five sections to illustrate this point: Lead and Inspire; Believe and Praise; Love and Respect; Teach and Learn; and Live and Enjoy. Then, Limbert starts each section with an introduction, explaining how the concept applies to both coaching and parenting. For instance, he begins the book by stressing the important role you play as the leader of your family. Love might seem like an unusual topic for a sports book but, as coach Phil Jackson explains, “Love is the force that ignites the spirit and binds teams together.” Therefore, before Limbert shares quotes about love and respect, he explains the important connection between the two, how it’s “a fundamental component of leadership and a gateway to compliance.” He claims if you treat your child with love and respect she responds accordingly. Quotes from famous coaches. Pictures of sports icons. Memories of lessons learned. 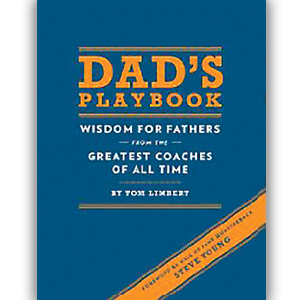 Dad’s Playbook by Tim Limbert is the perfect addition to your coffee table. Place it next to the remote control and the sports enthusiast in your house is sure to pick it up, if not at half-time then at least during a seventh inning stretch.